I’m taking on a new project for a customer, a 1960/61 Hornyphon Attache 61 radio. 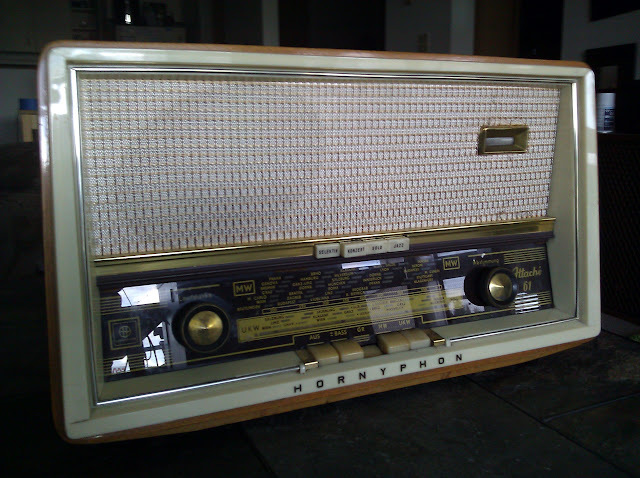 My client listened to this radio while growing up, and hand-carried it from his mother’s estate on a plane from Austria to the United States in the 1970s. It’s a German-constructed radio with all markings and service data in German, 7 tubes, AM and FM. It’s been kept in immaculate condition, and looks nearly new even after 50 years. This entry was posted in Photos, Projects, Radios and Tubes, Vintage and tagged antique radio, Attache 61, Hornyphon, repair, restoration. Bookmark the permalink. I would like to Thaks first sending schematic plan of the above tube radio. I shall want to regenerate my tube radio, but the problem is some parts are not awailable in our local trade market. Specially High value Kondensors and IF Transformers (UKW/MW/LW).However I thanks lot for sending me above valuable documets. I wish you all the best.